Nancy has been doing better lately. She dropped that gawdawful botox and so she makes real-seeming facial expressions and everything. Sometimes she doesn’t slur and almost makes sense. Schmucky was perched on that couch looking like a grotesque gargoyle. Hes repulsive. Nasty Woman is just a nazi in a thousand dollar skirt. Both of them live to advance the destruction of America and their own enrichment. They are dispicable. Ok, FReeQs. Which one of you just called in to Hannity? Oh, that’s probably very true! Given the results of the mid-terms, we can’t take the chance of removing a Trump-positive vote. P.s. I was the Time magazine Person of the Year in 2006. Be assured that Cain’s original documents were given to DOJ. He had certified copies at his home. On Fox Cavuto just had Raja Krishnamoorthi (D) from IL who just said 69% Americans don’t want the wall! The is no way that is correct! It really is getting ridiculous. We need a network that tells the Truth so bad. I’m in the country so I’m limited to satellite. If I didn’t have FR I wouldn’t know anything! The presiding official for the Senate trial is the Chief Justice of the SCOTUS; Roberts. Also, Senate rules need to be understood. Will the House motion go to the judicial committee first? Can the Committee decline to move it forward? To: BiggBob; upsdriver; Steven W.
Yep. Got it. Sorry for the confusion. When I first pulled that article up, missed the date in the faint gray font on my screen, confused by the writing, raced off to do a search to vet it, saw something that said “Posted 10 hours ago” further adding to my confusion. PPS: I see the eye doctor the 13th. Yes, I really do. The DOJ is a very large org and at least half filled with scumbags. Is there any word that the originals got to where they needed to be or were they intercepted by derps? word is that the dox were given to Huber and Huber codified that Cain had whistle-blower immunity. Huber then sent the dox to the House Committee. So in the defense budget, if theres $34 billion extra and Congress does not say that the money must be spent here, and if they do not earmark every dollar of the defense budget for certain projects, that means Trumps theory is that, hey, thats the money thats not earmarked, its not specified, I can take it and do with it what I want since Im commander-in-chief. I have never read or got any inkling from anywhere that every $ the military spends must be specifically authorized by Congress; that's what it sounds as though RL is saying. Doesn't make any sense to me, either. Sometimes the military may have to make quick decisions about spending, such as in wartime, etc. They can't wait for Congress on such matters. Welcome to the 100th edition of the Oracle. It's been a long , hard road, sportsfans, but here we are; on the precipice. 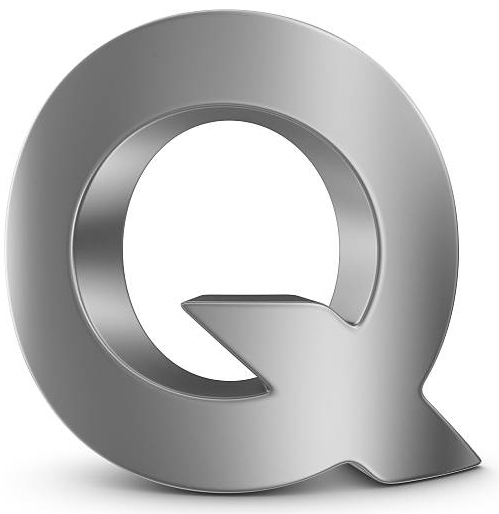 Battling our own people for a place to help save the world, with Q's guidance. I would like to take this time to recognize the FreeRepublic Q community, one and all. From lurkers, contributors, researchers, analysts, arguers, seldom posters, riddle solvers, idea men/women, jokesters, memesters, and yes, even the trolls. Each and every one of you have contributed to this adult experience. Q and the Donald would be (and I bet are), not only aware of our efforts, but are proud and thankful that there is still a segment of the older generation that is willing to fight for this country in whatever way we still can. So, I offer my personal thanks to each and EVERY one of you. Yes. Even you Jack Black. Even antis like you help, in your own twisted way. At the very least, you give us something to look forward to. Who among us doesn't anticipate with much glee the day we get to point and laugh at you, as you weep the tears of the disappointed. 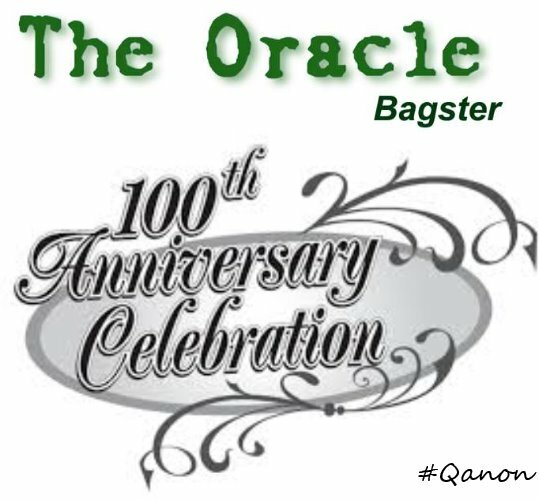 Thank you, one and all, for 100 editions of our Oracle. This is your work. I just put it together. And now, let's see what stories the Oracle is following. And with much haste. Q has started to post the next day's drops as this is being written. Adam Shiff pops off, and then this. Congress has a 'hush fund' & WE THE PEOPLE demand the users be revealed. Oooops. Is Adam Schiff a rump ranger? No wonder he sets my gaydar off. Stay tuned. Here's some good reportage on the expanding "Yellow Vest" uprising against the Derp Eu. This time, it's the UK. 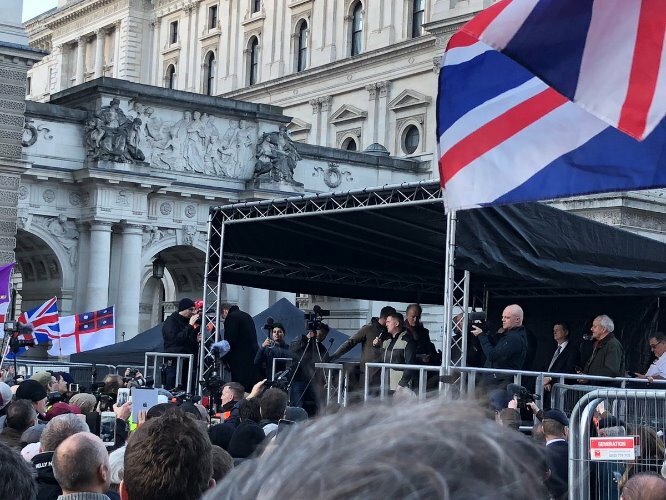 Brexit, Tommy Robinson, and Q related. Little Jeremiah-Can You Hear The People Sing. This is the Sara Carter interview on Hannity to go with the Solomon interview. Both had been "postponed" due to dead derp Poopy Bush. And finally, the Maia weighs in on the state of FReeQville. FReeQs, now that things are ramping up, I humbly assert that it is time for us to do another reassessment of ourselves. Weve come so far, lets not muck it up now. New FReepers will be checking in to see whats going on here. Lets hit them with our best stuff in a constant barrage. And now, on to Q. At what point do people wake up? The first link in the post is an 8chan "bread" dominated by trolls spewing anti-Q rhetoric. Next thing you know? BAM. Account suspended. 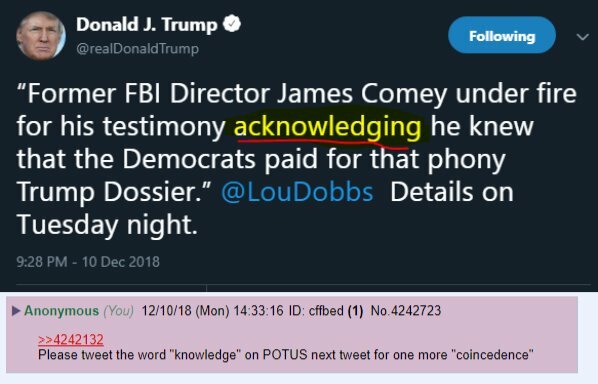 The graphic also show that an anon asked Q to have Q+ post the word "amazing". In his very next tweet, the Donald posted "Amazing". And then this was posted on 8chan. I tweeted this to show I listen. This is the only post I will make. An anon then posted, "***He*** walks among us. He, being Donald J. Trump. 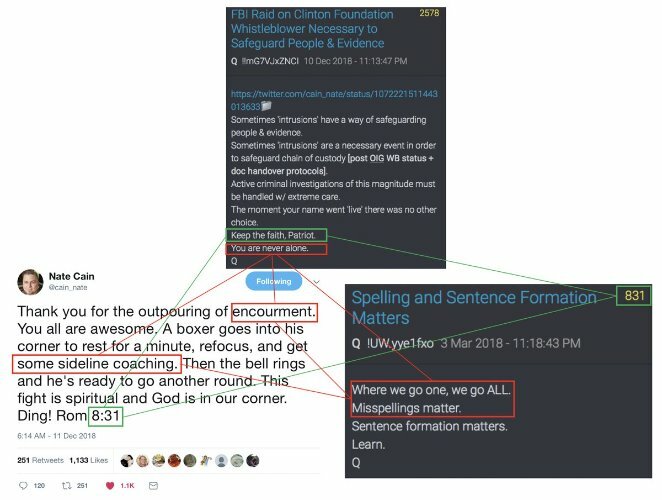 Q then lists his most recent Q proofs (Scott Free, Q+/QO) and others, along with this graphic. He explains that Q is Trump's way to "safely and securely" use back-channels to communicate with the public and bypass the Fake Derp news media while staying within the law and not compromising national security. This post is recommended reading for all those trolls who doubt the authenticity of Qanon. Define 'Getting Ahead of the Story'. Awwww, he's talking about us. How adorable. Q suggests that Podesta is panicking, projecting, and getting ahead of the story. The story being the D13 (this week) Humber testimony before Congress. 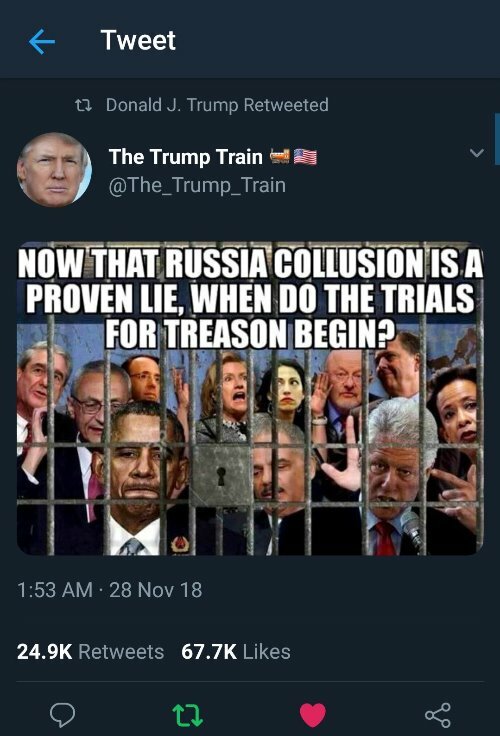 He asks the anons to add John Brennan to the photos of derps behind bars. THE FIGHT TO SAVE THE WORLD. Enigo54 suggested reading this from the bottom up for better clarification (mirror). This seems a worthy interpretation, according to FReeQ consensus. 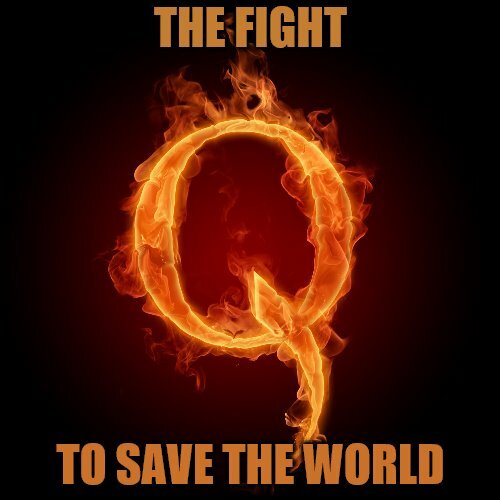 THE FIGHT TO SAVE THE WORLD began in ernest in 2015, when FOREIGN AND DOMESTIC PATRIOTS and the FREEDOM CAUCUS (established/EST in 2015), along with the UNITED STATES MILITARY (Generals/G), the NSA, and soon to be President Donald Trump came up with THE PLAN. Given as patriots are POTUS and Military (the Generals that surround him). The Freedom Caucus, established 2015. At the same time, F&D patriots were formed, home and abroad. Together they fight to save the world (from tyranny). The Oracle likes this interpreation. A lot. And an anon was lickety-split, on the J O B with Q's previous request. Notice the mongoloid, fathead in the bottom left. 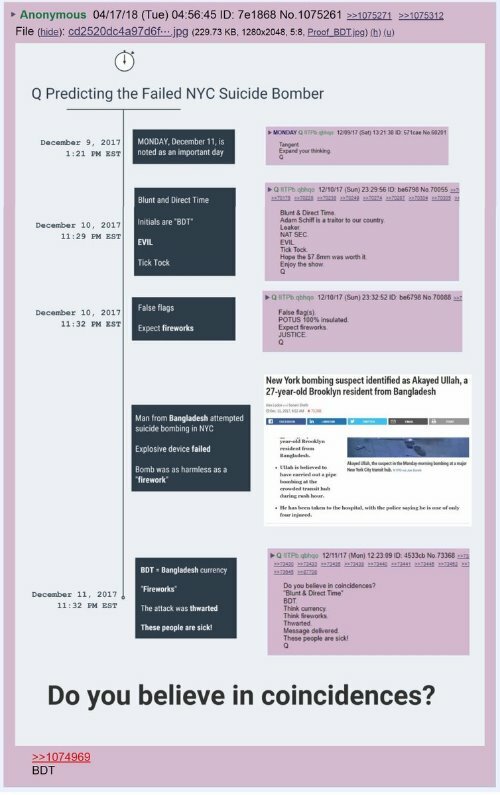 Q is grateful for the anon's quick work. Drops 'layered' to provide 'advance knowledge'. More grist for the unbelievers. "The times are too grave, the challenge too urgent, and the stakes too high  to permit the customary passions of political debate. We are not here to curse the darkness, but to light the candle that can guide us through that darkness to a safe and sane future." This would be a good quote to spam on the "woe is me/nothing's happening" FR threads that are legion beyond the fence. "We are not here to curse the darkness, but to light the candle..."
Way to light the candle, FReeQs. 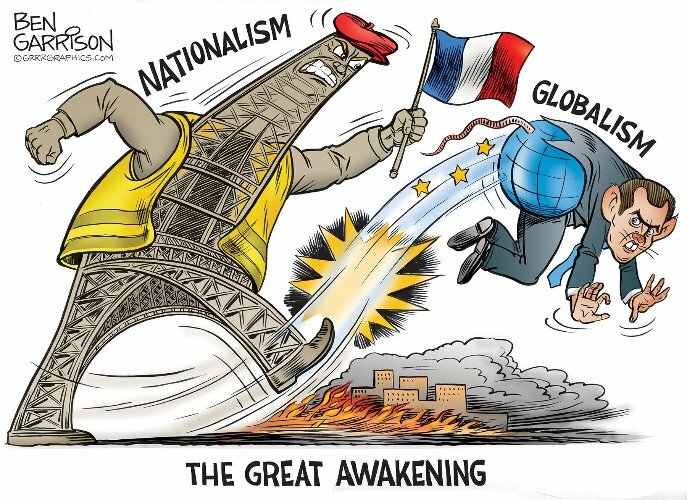 A GREAT Paul Joseph Watson video on the Yellow Vest movement. Is Steve Bannon playing a role in the EU uprising? 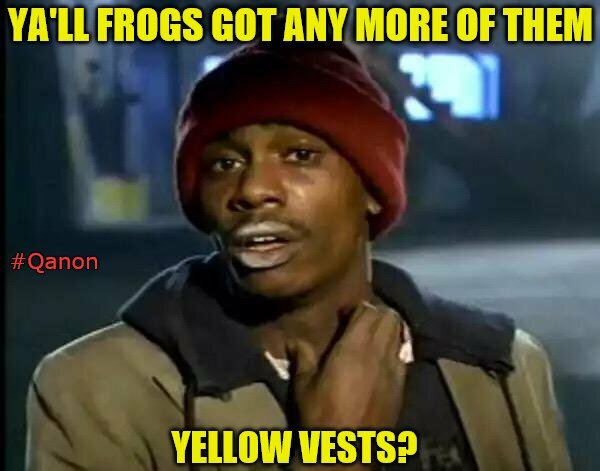 Spokeshave2-Steve Bannon and the Yellow Vest Movement. Donald Trumps former strategist has been touring the continent and attempting to sign parties up to his pan-European populist project. Structure Change Coming to Federal Reserve Banking System? The plan to have the FED raise rates [steep incline beginning Mar 2019] in an effort to 'kill' the economy prior to 2020 P_elec is known and planned for. We FReeQs have guessed in the past months that the derps would try to kill the economy to effect the 2020 election (think Obama election). Q tells us there is that plan, and they are aware of it and will do some "structure change" in reponse. Those with the most to lose are the loudest. 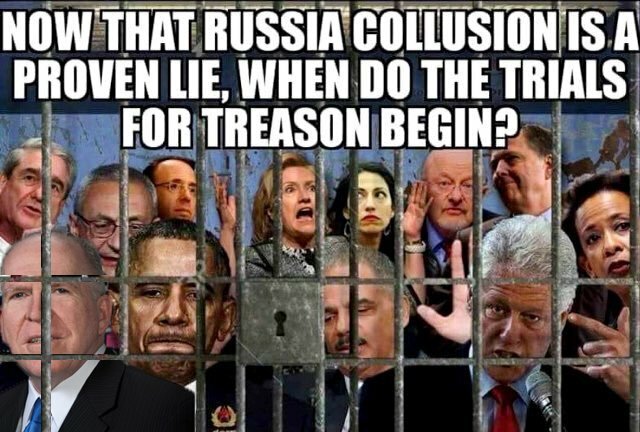 Those who 'knowingly' broke the law in a coordinated effort [treason] are the most vocal. But best not to quote him in a headline. Q suggests that Samantha Powers (amongst others) is "screaming the loudest" because she KNOWINGLY BROKE THE LAW in a COORDINATED EFFORT TO COMMIT TREASON. He calls what she (and others) CRIMES AGAINST HUMANITY. 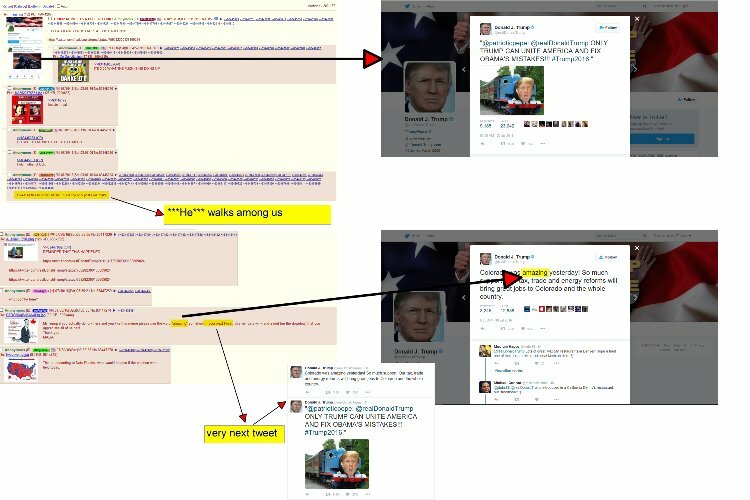 An anon posts a Q proof. "+17 min(ute) delta between tweets" means that there were 17 minutes between Trump's tweets. 17 of course the universal number representing Q. Sometimes 'intrusions' have a way of safeguarding people & evidence. Sometimes 'intrusions' are a necessary event in order to safeguard chain of custody [post OIG WB status + doc handover protocols]. Active criminal investigations of this magnitude must be handled w/ extreme care. The tweet from Clinton Foundation whistleblower Nate Cain, who had his home raided by the FBI. Q speaks directly to Mr. Cain and lets him know that once HIS NAME WENT LIVE it became necessary to protect the CHAIN OF CUSTODY once he whistleblower (WB) and document (DOC) handover protocols went into effect from the Office of the Inspector General (OIG). Now we finally know which side was responsible for the raid. And it doesn't appear to be the Mueller side. 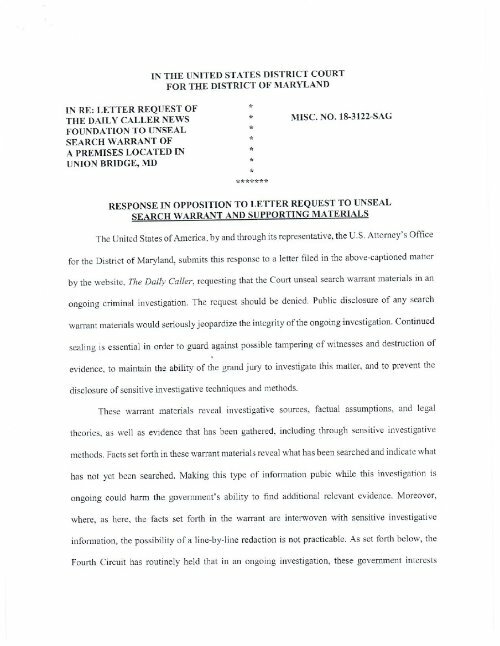 Note that Q calls this a CRIMINAL INVESTIGATION. Cats Pajamas dug this graphic up. Follow the lines. Check out this response (submitted by bitt) to the DAILY CALLER'S request to unseal warrant details on the Cain/FBI raid. The court denies the DAILY CALLER'S request due to an "ongoing investigation". 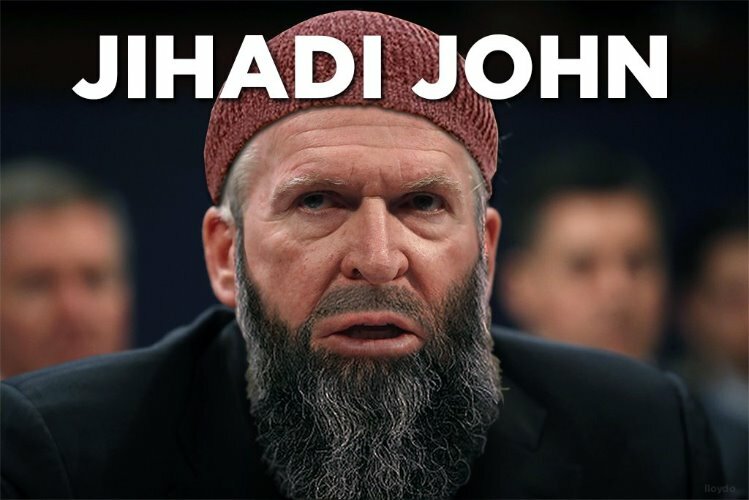 More reason for PANIC IN DC? What's next, in this incredible moment in history. Stay tuned. How do you know the DoJ is at least half filled with scumbags? 1. Keep docs out of the hands/eyes of derps so they don’t know what the gov knows. 2. Make it all public so the whistle blower’s life is protected. Maybe some of the Congress critters that stepped down knew of a higher calling? Roberts vs 45 spat optics to have Left = TRUST ROBERTS? or.... Roberts recuses on some cases? Roberts got dirt. Forced to step down? RBG + Roberts + Kagen’s health wobbly? Dems desperation grows? SC can’t function? Oh noes! Countermove in reserve? WB = whistleblower. I got it! Barr was a “suggestion”. Smocking gun. Was it decided? Podesta body paints with the flesh of innocents? Hep me Cletus! I’m so far behind. But enjoying the show!